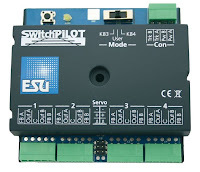 One of our favorite products is the ESU Switchpilot line of accessory DCC/Motorola decoders. 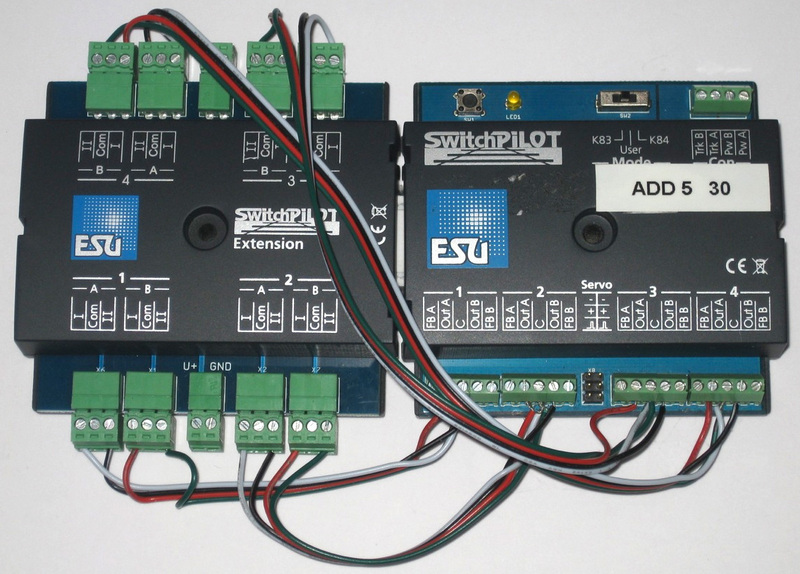 The basic ESU Switchpilot (ESU # 51800) can control 4 twin-coil switch machines or 8 electrical loads such as lights, uncoupling tracks etc. It also comes with two connections for controlling servo motors (which can be used for animation or throwing turnouts). 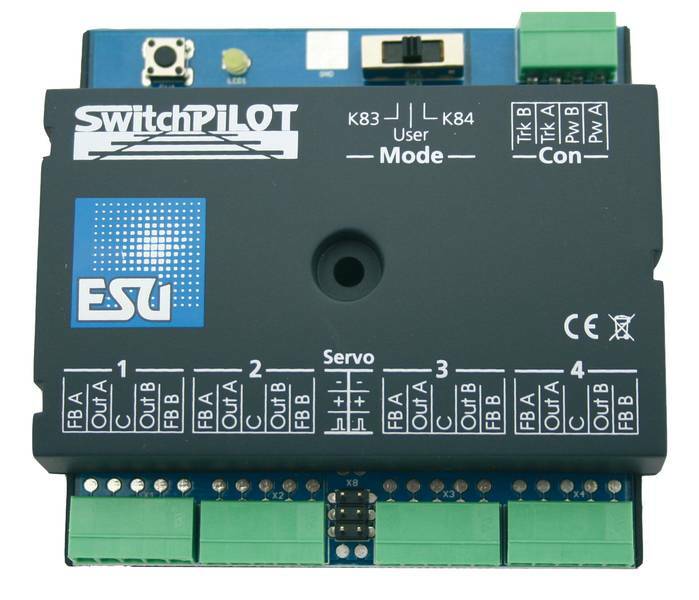 The Switchpilot Servo (ESU # 51820) is the all-servo version of the Switchpilot decoder with only 4 servo connections. Both versions offer a wealth of programming options that let you completely customize the way the decoders operate. We don't know of any other accessory decoders that feature the wide range of control and customization that the Switchpilot offers. Additionally ESU also produces the optional Switchpilot Extension (ESU # 51801) which adds 4 twin relay outputs linked to the Switchpilot/Switchpilot Servo 4 main outputs. These relays are great for isolating electrical loads, polarizing turnout frogs, or any other wiring situation you may encounter. One question we are often asked is how to use the Switchpilot line of decoders with bi-polar switch machines* such as those used in Kato Unitrack or the popular Tortoise slow-motion switch machines commonly used in North America. Many other accessory decoders do not support bi-polar switch machines or only offer limited support. The Switchpilot with a Switchpilot extension is able to fully control bi-polar switch machines and offer a lot of configurable options to make them work exactly as you need them to with only a bit of extra wiring. The basic wiring diagram below shows how to connect a bi-polar motor to the Switchpilot and Extension. Bi-polar single coil switch machines (such as Kato Unitrack): These can be controlled using the above wiring diagram and the Switchpilot/Switchpilot Extension right out of the box. The Switchpilot comes pre-programmed to support the short electrical pulse needed to throw the switch. Just program the accessory address into the Switchpilot and you are ready to go. Stall-Motor Switch Machines (such as the Tortoise): Bi-polar switch machines such as the Tortoise require a constant current to hold the turnout in position. To enable this in DCC operation you simply need to program CVs 3, 4, 5 and 6 on the Switchpilot to a value of 64 (enabling constant power for each output - see the Switchpilot user guide page 28 for more details). For the Marklin Motorola digital format you only need to move the small slide switch on the Switchpilot into the K84 position (simulating a Marklin K84 decoder). Important: If using stall-motor machines, it is highly recommended to use a separate power supply (not track current) to power the Switchpilot so that the constant current draw of the motors does not effect the track power supply and digital signal. * Bi-polar switch machines work by reversing the current flow through a single coil or motor to throw a turnout and come with only two wires. The more standard twin-coil switch machines such as those used buy Marklin HO and Z scale turnouts use 3 wires.